March is only half over and already Common Ground has been incredibly busy! Rev. Monica and Rev. Kenya were joined by our Road Fellow and our seminarian to share Ashes to Go for Ash Wednesday. Now in its second year, Ashes to Go offers the imposition of ashes to any who wish to receive them right in the heart of downtown Atlanta. Ash Wednesday was also observed at Morning Prayer and Bible Study. In the afternoon, we sought shelter from the cold with our community at Landmark Diner sharing the liturgy and receiving the imposition of ashes around the table, complete with the diner’s overhead speakers gifting us liturgical music of sorts - classics on the overhead speaker from Bob Seger, Jimmy Ruffin, Michael Jackson, the Supremes, and Phoebe Snow. God, who knows all sorrow, all suffering, and even all laughter, we thank you! In February, Pastor Monica, Frank, and Antony took part in voicing support for HB 528 to Expand Expungement of Convictions in Georgia, and Monica returned to the Capitol to advocate again on Ash Wednesday. Unfortunately, earlier this month it was announced that the bill did not move forward. Our intrepid parishioner-students have been studying many things in the latest installment of Theology from the Margins including these topics: Theological Methods, Jesus and the God of Israel, Salvation, and a close look at our creeds. 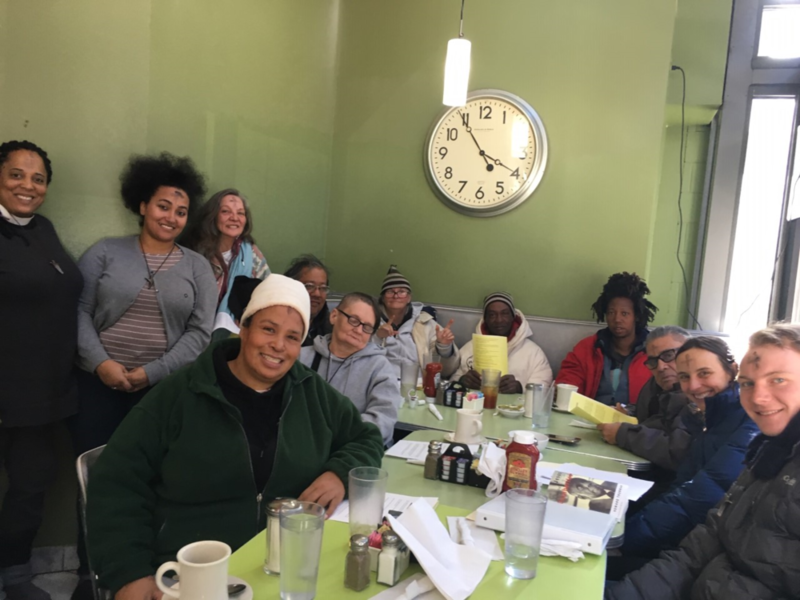 Last Sunday afternoon, parishioners joined Monica at a Lenten study we’re participating in with St. Luke’s and All Saints’ studying James Cone’s The Cross and the Lynching Tree. On Monday, Pastor Monica attended the book launch for Barbara Brown Taylor’s new book—Holy Envy. Church of the Common Ground is the focus of the book’s epilogue! And, on Wednesday, our annual Lenten Bible Study speaker’s series welcomed The Rev. Horace Griffin of St. Luke’s Episcopal Church, who guided us through chapter two of our Lenten focus, Howard Thurman’s Jesus and the Disinherited. Still to come are The Rev. Thee Smith of the Cathedral and The Right Rev. Rob Wright, our bishop! Next weekend, a lay leadership cohort of parishioners will go with our clergy to Kanuga for a retreat focusing on social justice, and the following week the Theology from the Margins course will take place on Columbia University’s campus. A holy, and a bit full, Lent! We welcome you. Come and see!